Rhythm Changes Chords are essential to check out. 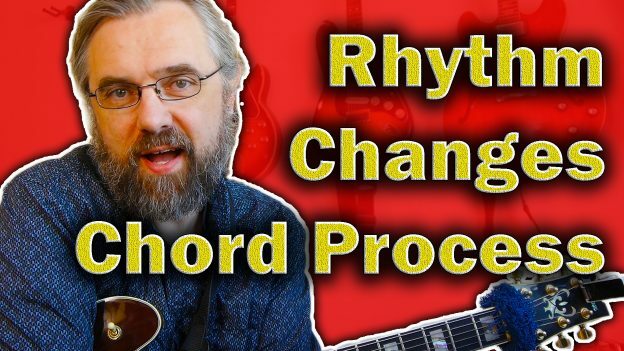 If you want to explore jazz and bebob guitar then the rhythm changes progression is a must. The progression is often used and parts of it are common in countless other songs. In this lesson I will first go over a basic set of chord voicings to play the progression. I will then expand on these voicings by first turning them into rootless voicings. Then I will show you how you can start making variations of the top notes to create more interesting comping ideas like that. Finally I will go over how you can even add notes and create another set of 4-note voicings. We don’t need a lot of different voicings to play a Rhythm Changes A part. In fact it is mostly the same turnaround: I [V] II V and then a short trip to the IV and back. An easy way to create some more flexible 3-note voicings is to just leave out the root. This is shown here below in example 3:These are more flexible and it is fairly easy to change the top note so that we can play several melodies using these voicings. Another way to vary the melody is to add an extra note on top of the voicing. This can be done quite easily since we are only playing 3 notes. As you can probably see these voicings are mostly drop2 voicings. This way of coming up with different chord voicings is of course a way of giving yourself options, but is is also a way of associating different voicings together so that we don’t have to remember unconnected sets of notes. This is a very practical way to think about chords and a great way to help you learn a lot of chords by just really remembering one. This entry was posted in Blog, Lesson and tagged changes, chords, guitar, Jazz (Musical Genre), jazz comping, jazz guitar, jazz guitar lesson, Jens Larsen, rhythm, rhythm changes, rhythm changes chord progression, rhythm changes chords, rhythm changes chords guitar, rhythm changes comping on May 17, 2018 by jens.